Middle Ages Wire Wrapped Collectible Sword | BUDK.com - Knives & Swords At The Lowest Prices! 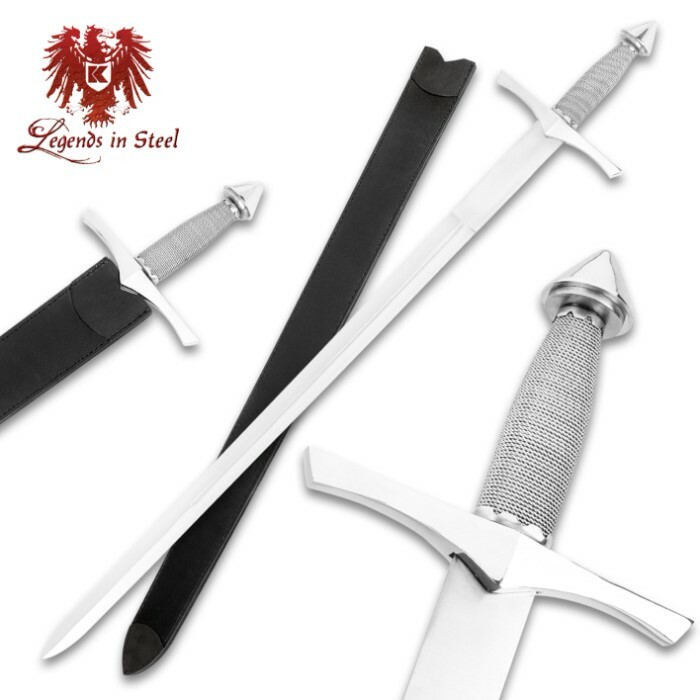 Crafted and designed with the collector in mind, this top-quality Medieval Master Wire Wrapped Collectible Sword features a high-polish stainless steel blade with a deep blood groove on each side. The wire-wrapped handle has an oversized guard and pommel, lending authentic details to this historically inspired sword. No Medieval Sword collection would be complete without it. Complete your collection today! Cannot beat this sword for the price. Nice and light to hang on a wall and makes a great costume prop. I bought two, one for myself, the second as a gift and it was a huge hit. A very nice gift. My son loves it. I would like to say that this sword is" AMAZING" I couldn't describe it any other way. You have made me to relive my youth and start collecting decorative swords again. I have to say that you have a wide variety of swords to suit every ones needs, be it display swords, carbon swords Samurai swords which is razor sharp and wooden practice weapons. I bought myself one of these a while back, and am quite pleased with it - much more than i'd expected. I figured it would look good on the wall from across the room - and it does. also from up close and it fits nicely in my hand. So I just bought one each for both of my children. The swords haven't quite made it to my children yet... Soon, really. An excellent product, very pleased, thank you. Very pleased with the sword which can complement any general situation where a sword is required such as a photo shoot, play (prop), skit, etc. This sword was perfect for our annual Christmas photo greeting card with authentic Scottish kilts. Price was very affordable. Bought this for my wall collection . It is a beauty at a great price. Before I bought this sword, I knew that it was made for display. With that aside, I will say that it is well built. Yes, it is not full tang, it is stainless steel, and it is dull. However, it has pretty good weight behind it, well built for what it is, and it good for dry practice. Assuming that you don hit anything but the air. still works on form though. Oh, and do not expect too much from the sheath. Mine came warped but it will work.